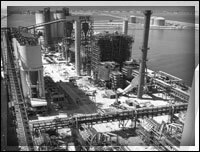 The discovery of oil in the 1930s transformed Bahrain into the Gulf's first oil economy, but early acknowledgement on the part of the Government that oil resources could not generate sustainable economic growth led to the well-engineered diversification program that has yielded today's broad economic base, where oil refining and manufacturing coexist with sophisticated financial, commercial and service sectors. 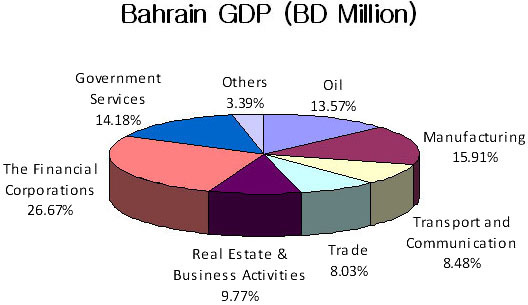 Bahrain is the most diversified and least oil dependent country in the GCC states. Bahrain became a member of the United Nations and the Arab League in 1971. In May 1981 it joined its five neighbours - Kuwait, Oman, Qatar, Saudi Arabia, and the United Arab Emirates and formed the strategic alliance called the Gulf Co-operation Council (GCC). The GCC seeks to strengthen cooperation in areas such as agriculture, industry, security, investment and trade among its six member states. Bahrain has an independent legal and judicial system with a framework of commercial laws and, on this strength and its well-developed infrastructure, has become an international and GCC arbitration centre. Bahrain has been ranked the 16th freest economy in the world, ahead of Japan, Germany, France, India and China and the freest economy in the Middle East according to 2009 Heritage Foundation/Wall Street Journal Index of Economic Freedom. It is ranked as the most liberal economy in the Arab world and boasts one of the most modern cosmopolitan societies in the entire region. 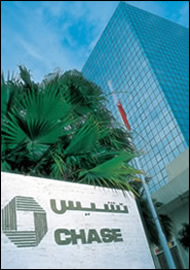 It is also the region's financial and banking centre with some 400 banks and financial institutions. The government of Bahrain encourages free trade and foreign investment by allowing 100% foreign ownership and control of company assets and enforces no personal, corporate or withholding taxes. According to World Investment Report, UNCTAD (September, 2008), the Inward Performance Index 2007, Bahrain rank the 12th position out of 141 economies, ahead of all GCC nations. For the Outward Performance Index 2007, Bahrain ranks 9th of 141 economies, and is ranking ahead of the GCC nations United Arab Emirates, Qatar and Saudi Arabia. The country is also a founding member of the WTO, having gained accession in January 1955. Determined to maintain an open economy that is conducive to both economic and social growth, Bahrain continues to evolve its legal and administrative infrastructure. The most significant move on the part of the Government, in this regard, has been the introduction of the new Commercial Companies Law that has come into effect on January 1, 2002. 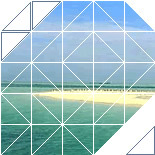 "One-stop" facility responsible for assisting investors with application procedures. The national currency is Dinar, with each dinar divided into 1,000 fils. The Bahraini Dinar is pegged with the US dollar at US$ 1= BD0.377. 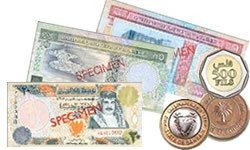 Notes are available in denominations of 1 dinar, 5 dinars, 10 dinars, and 20 dinars. Coins come in units of 5, 10, 25, 50, and 100 fils. Currency can be easily exchanged at the airport, hotels, banks and the money changers.